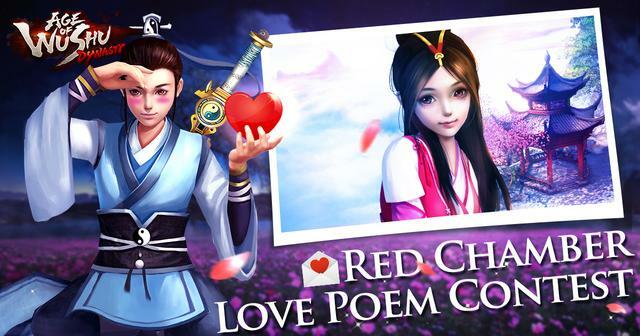 Romance is in the air, and with the announcement of the new Red Chamber update and the new marriage system, it's time to let your true feelings out with our new Love Poem Contest! The idea is simple - write a short poem about love in Age of Wushu Dynasty, and submit it to the community either on our Forum or as a comment on our Facebook event post. Our favorite submissions will be collected and made into a graphic, and the community will vote for their favorite! And dream to tell her how I feel. Submissions should have the poem, as well as your In-game Name and Server to be considered valid. All valid submissions will receive a participation reward. Based on the submissions, our community team will choose several of our favorites to be made into graphics and uploaded to an album on Facebook. The community will cast their votes through Liking, Commenting on, and Sharing their favorite pictures. The community to 2 favorites will receive a grand prize. Submission period will be available from June 3rd to June 14th. Voting will take place from June 15th to the 20th. Winners will be announced on the 21st.